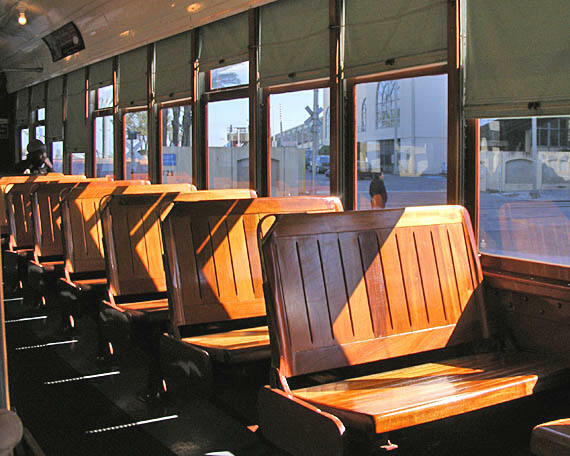 The interiors of the Perley Thomas cars reflect a very different transit era. The wooden bench seats have reversible backs. There is no air conditioning, and in a climate that is warm and muggy for much of the year, the windows can be raised far up. The vehicles were originally manufactured more than eighty years ago, between 1922 and 1924. Substantial rehabilitation and upgrading has been done since; but inside, it seems as if one is stepping back in time. Unlike on most newer systems there are no fare machines at any of the station platforms. The operator must assure all patrons pay a valid amount, or show an appropriate pass or transfer; and he or she is responsible for issuing transfers. The regular fare is $1.25, and a transfer is another twenty-five cents. All-day streetcar and bus passes can be obtained at selected merchants for five dollars. This view is inside a Canal Streetcar which has recently turned off the Riverfront line, and is heading up its namesake street out to Cemeteries. There is a very light passenger load.